If we were taking bets on the next "Spot" whiskey to follow Green Spot and Yellow Spot, the smart money would have favoured Red, with Blue attracting few takers at very long odds. I wish I had been running that book because Irish Distillers surprised all of us yesterday with a wine-finished Green Spot instead. A few years ago the official line from Midleton distillery would have been "we don't do finishes". Last year, though, we had the beer-finished Jameson Caskmates, which was more of a happy accident than something planned. More recently we had the Midleton Dair Ghaelach, pot still whiskey transferred to Irish oak casks for the final 10 months of maturation. Again, that might be ascribed to special circumstances: the need to experiment with the new type of wood, the heavy effect of virgin oak, etc. 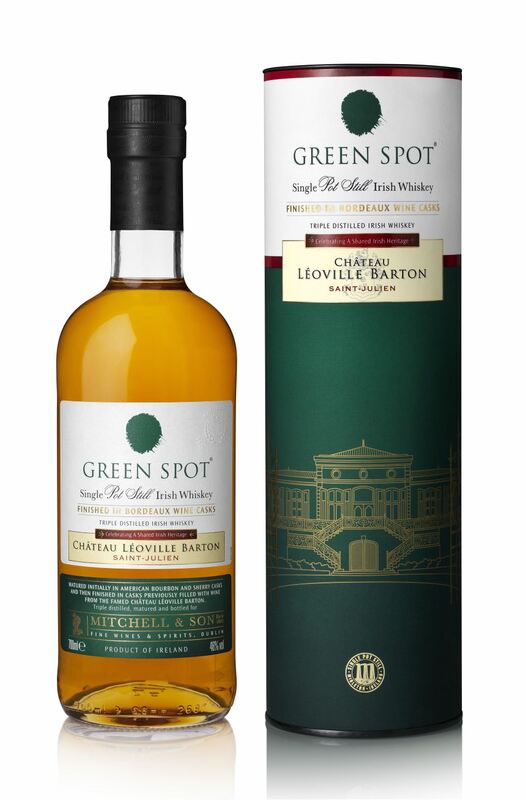 The new Green Spot Château Léoville Barton puts finishes firmly on the menu once and for all. It's regular Green Spot that has been vatted together from ex-oloroso sherry and ex-bourbon casks, then transferred to red wine barriques from a Bordeaux winery. After 12 to 24 months resting in these casks, Midleton's master blender, Billy Leighton, constructs the final bottling. The new whiskey was launched at an event in Bordeaux layered with significance. The Spot range of pot still whiskeys was created by one of Dublin's traditional wine importers and whiskey bonders, Mitchell & Son, founded in 1805. It's still a family-run enterprise, with Robert and Jonathan Mitchell making the trip to Château Léoville Barton yesterday. The winery is also a family affair, overseen by Anthony and Lilian Barton, direct descendants of Irishman, Thomas Barton, who founded a wine merchant company there in 1725. The new whiskey recalls and updates the historic links between Ireland and France, and between whiskey and wine production in the two countries. The new Green Spot is bottled at a higher strength (46%) than the classic version (40%). It'll be available from this month in five markets ("including Ireland, the UK and France" - I don't know why they don't just list all five in the press release). RRP is €65. Depending on sales and the reaction from the whiskey community, it might become a permanent part of the single pot still range. 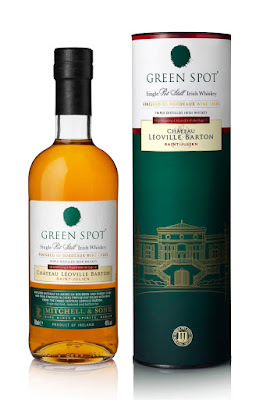 Maturing Green Spot in the Château Léoville Barton wine casks provided a fascinating assortment of floral and wood characteristics on the nose and palate, which give way to a long, spicy finish reminiscent of the terroir in France and Ireland. It is the contribution of the French oak which drives the initial aroma adding some crisp woodland notes to the spicy Single Pot Still character. The wine seasoning brings a delicate touch of floral perfume and a hint of ripe berries such as raspberries and strawberries, these are in addition to the orchard fruits typical of Green Spot. The familiar mouth coating effect is a very satisfying balance of oak and spices. Some vanilla sweetness works in harmony with the dry wine influence, while the fresh orchard fruits and French oak combine effortlessly with barley grains to complete the complexity. The rich French oak character is slow to fade leaving the wine and spices of France and Ireland with the last word. 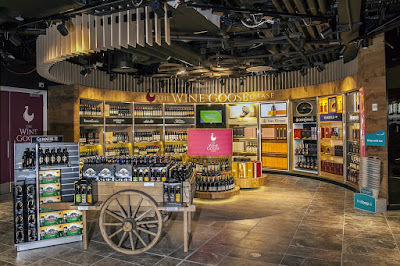 On the shelves there you will find Château Léoville Barton's eponymous wine, along with La Reserve de Léoville Barton. It would be a fascinating experiment to try original Green Spot, the wine, and the wine-finished Green Spot side-by-side.